Conflict is a state of disagreement between two or more parties. This disagreement can be realized in both peaceful and violent manifestations. A clash of interests, values, actions, or directions often sparks a conflict. Conflict occurs on a many levels—within the individual when a person confronts their own competing desires; between individuals such as in a marriage; between groups of individuals, such as work groups; between societies or cultures, such as different religions or ethnicities; or international conflict which may become a fully fledged war. While differences are natural, the ways to resolve them can be violent or harmonious. Appreciating diversity of opinion, ability, and interest is the beginning of living in harmony, allowing the development of new ideas through give and take with each offering different information or skills. Overcoming the barriers between different individuals and groups, living in service to others, is a good foundation for successful interactions that will not lead to violent conflict. When conflict has occurred, reconciliation requires that each become sensitive to the other's perspective and experience, possibly through the use of a mediator. True reconciliation is achieved based on forgiveness. Actual problems - the behavior of those involved in the conflict leads to problems for themselves and others. Conflict is generally regarded as an unpleasant state of affairs. Terms associated with conflict by people from over 60 countries worldwide include anger, avoid, bad, control, destruction, fear, fight, hate, impasse, loss, mistake, pain, war, and wrongdoing (Weeks 1994). Conflict resolution is the attempt to reduce the tension and difficulties associated with a state of conflict. Methods of conflict resolution have been developed and applied in a wide range of social situations. Conflict can occur between individuals or between groups of many types. Among these variations are: interpersonal conflict between two people (such as within a family in the form of sibling rivalry or conflict between husband and wife, or bullying in school situations), group conflict between two groups (such as within a work environment), inter-societal conflict between two societies or cultures (such as conflict between Islam and Christianity during the Crusades, or between different ethnic groups within a country), interstate conflict (such as civil wars), or international conflict (war between two countries). Conflicts in these levels may appear "nested" in conflicts residing at larger levels of analysis. For example, conflict within a work team may play out the dynamics of a broader conflict in the organization as a whole. Conflict can also occur within an individual. This conflict can be rational opposition between logical arguments or can degrade into schizophrenia, in which a person's mind is actually divided against itself. Such a struggle is often subconscious and can result in great stress for the sufferer. Sigmund Freud believed humans suffer from a number of conflicting impulses for survival, sexual pleasure, and social restraint, which result in neuroses and other mental disorders. Double approach-avoidance - a choice between two things each of which have both positive and negative qualities. Together with the varying levels of conflict come a wide variety of external causes of conflict. These include specialization, in which niches fight over the right to assert validity of their position; interdependence, when a group cannot operate without the assistance of others; arguments over common resources; differences in goals; over authority; jurisdictional ambiguities; skills and abilities; values and ethics; and cultural differences. However, all conflicts have as their root cause self-centered behavior, when one's personal desires, or those of one's own group, are pursued without regard for the needs of the other or for the larger society to which both belong. The result of such selfishness is the breakdown of harmonious interactions or the initiation of aggressive and destructive behavior. Conflicts within the individual also arise from wrong motivation. Human beings often find themselves in situations where they experience a conflict between their mind, which seeks such eternal goals as beauty, truth, goodness, and love, and the body, with physical desires for such things as sleep, food, shelter, and sexual gratification. The conflict between these two types of desires is inevitable, since the nature and thus the needs of the mind and body are different, one being internal and eternal the other external and temporal. It is the challenge of all people to resolve this by training the body with discipline, and strengthening the mind to pursue goals of value while taking care of the needs of the body so that it can serve the mind's goals. Similarly, dealing with the types of internal conflict described by Lewin is a normal feature of choice between alternative courses of action. Learning to deal with these conflicting emotions is part of the process of individual character development. Human beings also experience a conflict between the mind's desires in pursuit of goodness, serving the whole purpose, and those that can be termed evil, namely those that seek to harm others, threatening or destroying the safety and well-being of others or even society as a whole. This type of internal conflict, which all people experience to some degree, is the subject of great debate. For many religions, this situation results from what may be called the Fall of Man, or a deviation of human nature from the original ideal of creation. In this view, the suffering resulting from wrong desires and our struggles to deal with such conflicts is something we are called to overcome. The secular view, particularly that of [[science |scientists]] who accept evolution as fact, tends to regard both internal and external conflicts as part of our "animal" nature that enables us to survive. Conflict theory attempts to explain social conflict through the idea that all participants in a group or society attempt to maximize their personal benefits and are therefore at odds with all other members of the population. This view stems from the Hobbesian idea that men are naturally selfish and in a constant state of war with one another. The idea was later elaborated on by Karl Marx who believed history to be the story of conflict between the wealthy and working classes. Marx taught that this conflict would eventually erupt into a society-wide war or revolution. The theory has also been applied to microlevel interactions. Aggressive behavior is common in many species. Conflicts and their resolution appear to follow somewhat similar patterns between those between human beings. Conflict resolution has been observed in non-human primates. Aggression is more common among relatives and within a group, than between groups. Instead of creating a distance between the individuals, however, primates were observed to be more intimate in the period after the aggressive incident. These intimacies consisted of grooming and various forms of body contact. Different types of primates, as well as many other species who are living in groups, show different types of conciliatory behavior. Stress responses, like an increased heart rate, usually decreased after these reconciliatory signals. These findings contradicted previous existing theories about the general function of aggression, such as creating greater space between individuals (first proposed by Konrad Lorenz), which seems to more accurately apply to conflict between groups. In addition to research in primates, in more recent studies biologists have explored reconciliation in other animals. Peaceful post-conflict behavior has been documented. Reconciliation has since been documented in such species as spotted hyenas, lions, dolphins, and domesticated goats. Conflict resolution is the ending of a conflict, or at least reduction of its severity. It may involve conflict management, in which the parties continue the conflict but adopt less extreme tactics; settlement, in which they reach agreement on enough issues that the conflict stops; or removal of the underlying causes of the conflict. Settlements sometimes end a conflict for good, but when there are deeper issues—such as value clashes among people who must work together, distressed relationships, or mistreated members of one’s ethnic group across a border—settlements are often temporary. True resolution of conflict involves not only a cessation of antagonistic interactions, but also a reconciliation—forgiveness and a new start in the relationship. There are many ways that can end a conflict, ranging from surrender or escape, acting with sufficient violence to defeat one's opponent, to filing a lawsuit so that the courts will resolve the issue. These methods assume that one side is either correct or stronger than the other. An alternative approach is to assume that agreement can be reached through communication between the parties. Methods involved in such forms of conflict resolution include negotiation, mediation, arbitration, and mediation-arbitration, which is a hybrid of the two processes. Negotiation, the most heavily researched approach to conflict resolution, has mainly been studied in laboratory experiments, in which undergraduate participants are randomly assigned to conditions. These studies have mostly looked at antecedents of the strategies adopted by negotiators and the outcomes attained, including whether agreement is reached, the joint benefit to both parties, and the individual benefit to each party. Researchers have found that problem solving behavior such as giving or requesting information about a party's priorities among issues encourages high mutual benefit. Contentious behavior, such as making threats or standing firm on one’s proposals, encourages failure to reach agreement or, if agreement is reached, low joint benefit. Conceding makes agreement more likely but favors the other party’s interests. The party who makes the first offer tends to achieve greater benefit than the other party. Three states of mind discourage concession making: viewing concessions as producing loss rather than as foregoing gain; focusing attention on one’s goal rather than one’s limit (the alternative that is minimally tolerable); and adopting a fixed-pie perspective, in which one views the other’s gain as one’s loss, rather than an expandable pie perspective. Adopting any of the states of mind above diminishes the likelihood of agreement; but if agreement is reached, it increases the likelihood of winning, especially if the other party adopts the opposite state of mind. Negotiators from individualistic cultures tend to take a more contentious approach, while those from collectivist cultures are more concerned about maintaining positive relationships and hence more likely to cooperate (concede or engage in problem solving). Accountability to constituents encourages contentious behavior for individualists, it encourages cooperative behavior for collectivists. Two common forms of third-party intervention are arbitration and mediation. In arbitration, the third party listens to both sides and then renders a decision, which can be either binding or advisory. Most mediation consists of third-party assistance with negotiation. When conflict is severe and the disputants have difficulty talking calmly with each other, mediators can put them into contact and help them develop a cease-fire or settlement. If the disputants cannot or will not meet each other, mediators commonly become intermediaries and shuttle between them. Sometimes a chain of two intermediaries is necessary because there is no single individual who can communicate effectively with both sides. Research into mediation suggests that it is usually successful in producing settlements. Disputants generally prefer mediation over arbitration, since it allows them to retain control over the final decision. This means that where failure to reach agreement in mediation is followed by binding arbitration, disputants will work harder to reach agreement than in straight mediation. In the case of small claims disputes, that mediation produces more compliance with the agreement than adjudication (a form of arbitration), perhaps because mediated decisions accord more with the parties’ needs. To be fully successful, mediators must be seen as impartial between the two parties. Having stronger initial ties to one side than the other is less damaging to the perception of impartiality than exhibiting bias during the mediation session. Disputants even sometimes prefer that the mediator be close to the other party so that he or she can exert influence over that party. Reconciliation is the transition from a broken relationship to a restored one. Often, the restored relationship is stronger than it was prior to the conflict. Reconciliation allows renewal, which opens new avenues of friendship based on the common experience of the conflict and its resolution. The process of reconciliation involves taking a closer look at the other and at oneself, which leads to greater empathy, understanding, and respect. 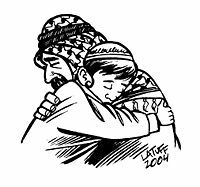 Forgiveness is essential to bringing to an end the tensions that exist in the conflict. It means giving up the claim to retaliation and allowing positive interactions to take place. Forgiveness does not excuse wrong actions, nor does it mean that they are to be considered acceptable in the future. However, it does mean that they are no longer a barrier to effective communication and harmonious interactions. Often forgiveness is difficult because the wounds of the conflict run deep. In many cases, it is the act of serving the other that allows these feelings to change. Thus, service learning, a form of experiential education, has been found effective in bringing together those who have had difficulties and allowing them to see each other in a new light. Whether this involves one party directly serving the other, as in a community service project in which white youths clean and restore parks and playgrounds in a black neighborhood, or where both parties work together to serve a third community, the act of service opens the heart and allows new understanding and appreciation of the other. Reconciliation becomes easier on this foundation. Among children, conflicts occur many times simply because of their immaturity. They are still in the process of learning to develop their social skills, and learning to resolve conflicts is part of their growth process. Schools offer a situation where conflicts will be experienced and where conflict resolution skills can be learned. To assist students in their development of such skills schools need to set high expectations for their students' behavior, conveying the message that over-aggressive and antagonistic behaviors will not be tolerated. At the same time, teachers need to give students choices so that they can work out their differences by themselves. Teachers can challenge students to analyze and suggest solutions to conflict situations. In this way children learn to take responsibility and go beyond the tendency simply to blame the other, expanding their responses to provocation beyond defensive reaction. Students also need to learn how to communicate their feelings and needs constructively. Violence often results from inability to communicate effectively. Effective communication skills involve listening and comprehending, as well as expressing one's own viewpoint well. Students can practice articulating the other's viewpoint to foster empathy and mutual understanding. Peer mediators are very helpful in resolving conflicts in school situations. Students can learn valuable lessons by acting as mediator and helping others to find solutions to conflicts. If peer mediation is not sufficient, teachers or school administrators may intervene to bring about resolution. Marriage is a relationship that arouses the deepest emotions, both positive and negative. The intimacy of married life creates greater expectations and requires greater trust. If this trust is violated, then the feeling of hurt and betrayal can be far greater than with friends and acquaintances, and certainly strangers. The closeness of the marriage relationship makes both parties very vulnerable; violations of trust cut deep and can be very hard to forgive. When faced with such pain and stress, people may feel trapped, and rather than seeking a solution are tempted to escape. Divorce has become increasingly acceptable, providing an apparently easy escape from marital conflict. Resolving marital conflict, however, is by no means impossible, although it requires hard work and investment on the part of both spouses. Marriage counselors (and family counselors when children are involved) are trained professionals who act as mediators to help a couple resolve their difficulties. It may help to depersonalize the issues. Often, marital conflict has roots in differences between gender roles, experiences each had prior to the marriage (particularly if these involved sexual abuse or other domestic violence), or cultural differences. When people focus on their spouse's shortcomings they may put love on hold and wait for him or her to change to match their own expectation of a spouse—often an impossible task. By accepting the other as they are and concentrating on self-improvement, investment in the relationship becomes possible again and harmony may well result. On a deeper level, husband and wife can learn to appreciate their differences rather than try to make their spouse more like themselves. This allows each party to more fully express their individuality, fulfilling their unique potential, and becoming the mature person that their spouse can love with increasing joy and satisfaction. Once they feel loved, people often are more open to change, and thus differences can be overcome with less antagonism. Religion is associated with man's attempts to plumb the depths of meaning in both himself and the universe. It has given rise to the most spacious products of his imagination, and it has been used to justify the most extreme cruelty of man to man. It can conjure up moods of sublime exaltation, and also images of dread and terror (Nottingham 1964). In recent times, religion itself has come to be viewed as an agent of conflict rather than an aid to conflict resolution and the establishment of world peace. The Thirty Years War (1618 - 1648) diminished the population of Europe by close to 20 percent, and has been attributed primarily to conflict between Protestants and Catholics, at least in popular understanding. The "troubles" in Ireland spanning much of the twentieth century were also between the Catholic and Protestant groups. Terrorism in the twenty-first century, especially following the September 11, 2001 attack on the World Trade Center, has been seen as perpetrated by radical Islamic jihadi against those of other faiths. The job of religion, though, is to empower human beings to change for the good. And, all religions have much in common, not the least of which is hope and desire for a world of goodness and peace (Wilson 1995). Thus, to exclude religion from the process of peace making is surely a loss to that process. But to be included in the peacemaking process, for example at the United Nations, contemporary religions must remove from popular opinion the assumption that strong religious belief is characterized by the likelihood if not inevitability of clash and conflict with anyone who does not believe in the same way. To be successful, conflict resolution on the world scale must include the elements of religion and spirituality that exert such powerful influence in personal and world affairs. For this to be successful, religious leaders need to find within their own faith the strength to dialog, to respect the viewpoint of the other, and, in many cases, to reconcile and forgive. Within the Abrahamic faiths is found the model of conflict recounted in the story of the brothers Cain and Abel in the first human family. According to the account in the Book of Genesis, Cain's offering was rejected by God while his brother Abel's was accepted. Cain was angry—"his countenance fell"—as he experienced the feeling of lack of love. 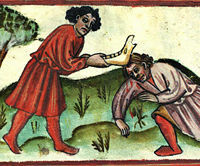 Acting on his jealousy with violence, Cain murdered his brother. 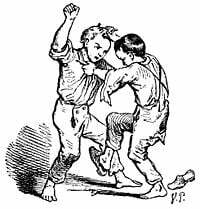 This story provides a formula for analysis of the archetypical enmity of brothers. In many conflicts these two relative positions are found: the "Abel position" in which one feels loved, valued, and respected when one's efforts are validated and appreciated; and the "Cain position" in which hard work goes unrewarded for no apparent reason while another receives all the praise, glory, love, and rewards that Cain feels are his due. The strong emotions experienced in these two positions are opposite: Abel feels pride, happiness, and satisfaction; Cain feels anger, resentment, and lack of love. When these powerful emotions are acted on the conflict escalates, often with tragic and irreversible consequences. Also told in the scriptures, though, is the story of Jacob and Esau, who were also brothers and who experienced a situation in which Esau rightly felt wronged as his brother stole his birthright by tricking their father, Isaac. In this case, however, their mother, Rebekah helped Jacob escape before his brother could hurt him. Then, after Jacob labored many years under conditions in which he was tricked many times, he overcame his trials and became prosperous. Returning to his family, Jacob acted humbly instead of with arrogance, and was able to placate his brother by sending much of his wealth ahead as a peace offering. Finally, when they met, Jacob bowed low and told Esau that "to see your face is like seeing the face of God" (Genesis 33:10). Through such service and respect, valuing his brother, Esau was able to forgive and the brothers reconciled. 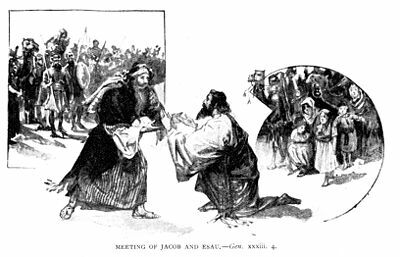 This story of Jacob and Esau stands as a model of conflict resolution. One party, through strength of character (in Jacob's case learned through 21 years of trials) is able to humble himself and serve the other, melting their heart so that forgiveness is possible, bringing mutual benefit. The act of serving the other is a key to opening their heart to allow a change of feeling from anger and resentment, restoring the feelings of brotherhood that existed originally. Conflicts among nations or ethnic groups today are the result of accumulated historical burdens of crimes and mistreatment. These are passed on from generation to generation because of ignorance or unwillingness to take responsibility for the past. Fortunately, each new generation offers new possibilities; children are not doomed to repeat the mistakes of their parents' and ancestors' generations. In today's world where technology allows us to communicate with people from all over the world and the increasingly globalized society requires us to work together, young people have many opportunities to relate to others. When they learn to relate to all people with respect, fairness, tolerance, and love they will be able to resolve the past conflicts and live in harmony. It is easier to reconcile when the other is seen as a fellow human being, also vulnerable, possibly suffering and in pain, or deprived of attention and with unmet needs. In twentieth-century South Africa the black population mounted ever increasing protests against the oppressive apartheid regime. The most respected black leader, Nelson Mandela, had been imprisoned by the white government for many years. President F.W. de Klerk knew that if he succumbed to pressure, both from the black population within his country and from around the world, and released him that the white government would inevitably fall. Against the advice of his fellow political leaders he released Mandela in 1990. 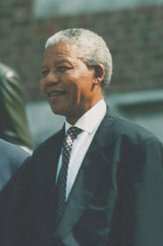 After his release, Mandela successfully appealed to end the violence and brought about a peaceful transition to black rule and a multiracial society. While in prison, Mandela underwent a transformation. Although belligerent when he was first incarcerated, he had a change of heart, and instead of nurturing resentment and hatred against those that put him there he rather made great efforts to understand the white Afrikaners, learning their language in order to read their books, and listening to the stories of the prison officers. Mandela was thus able to forgive the enemies who jailed him, setting an example of forgiveness and reconciliation for his countrymen. His switch to a policy of reconciliation and negotiation helped lead the transition to multi-racial democracy in South Africa. Mandela served as president, with de Klerk as his vice-president. The efforts of both men in regarding the other as a fellow human being with the common goal of peace led to a successful resolution, for which they were jointly honored with the Nobel Peace Prize. Rev. Dr. Martin Luther King addressing the press in 1964. "An eye for an eye makes the whole world blind". Martin Luther King, Jr. received a Nobel Peace Prize for his work toward peaceful resolution of racial segregation in the United States. He faced a culture in which he was judged as inferior because of the color of his skin, barred from drinking at the same water fountain, using the same toilets, sitting in the front of a bus, or eating in the same restaurants as white people. 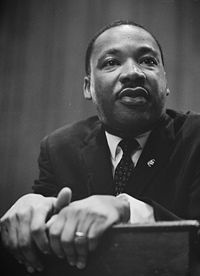 Although King and his fellow black Americans had every justification for resentment, anger, hatred, and the desire to act with violence against their oppressors, he taught non-violent civil disobedience as the way to achieve their goals: "We never get rid of an enemy by meeting hate with hate; we get rid of an enemy by getting rid of enmity." On receiving the Nobel Peace Prize in 1964 for his efforts, King said "Man must evolve for all human conflict a method which rejects revenge, aggression and retaliation. The foundation of such a method is love." Bercovitch, J., and A. Houston. 2000. "Why do they do it like this? An analysis of the factors influencing mediation behavior in international conflicts" in Journal of Conflict Resolution 44: 170-202. Coleman, P., & M. Deutsch. 2001. "Introducing cooperation and conflict resolution into schools: A systems approach." 223-239. in Winter, Peace, conflict and violence: Peace psychology for the 21st century. Upper Saddle River, NJ: Prentice-Hall. Kressel, K., & D. G. Pruitt. 1989. "Conclusion: A research perspective on the mediation of social conflict" in Mediation research. 394-435. San Francisco, CA: Jossey-Bass. Lorenzen, Michael. 2006. "Conflict Resolution and Academic Library Instruction" in LOEX Quarterly 33 (1/2): 6-9, 11. Nottingham, Elizabeth K. 1964. Religion and Society. Random House. Thompson, L., M. Neale, and M. Sinaceur. 2004. "The evolution of cognition and biases in negotiation research: An examination of cognition, social perception, motivation, and emotion" in The handbook of negotiation and culture. 7-44. Stanford, CA: Stanford Business Books. Veenema, Hans, et al. 1994. "Methodological improvements for the study of reconciliation" in Behavioral Processes 31: 29-38. Wall, J. A., D. Druckman, and P.F. Diehl. 2002. "Mediation by international peacekeepers" in Studies in international mediation 141-164. Basingstoke, England: Palgrave-Macmillan. Zartman, I.W. 2000. "Ripeness: The hurting stalemate and beyond" in International conflict resolution after the Cold War. Washington, DC: National Academy Press. Harvard Negotiation Project's Beyond Reason website - Conflict resolution resources and preparation tools from the Harvard Negotiation Project. Institute for Conflict Analysis and Resolution - at George Mason University. New Conversations Online Library Communication-skills and conflict-resolution books, essays, articles, scholarly papers & teaching materials. Search for Common Ground - One of the world's largest non-government organizations dedicated to conflict resolution.